Eastern Connecticut Ballet (ECB) will give its classic “Nutcracker” ballet a fresh spin this December with spectacular new scenery, additional special effects, and a setting that celebrates southeastern Connecticut’s seafaring past. 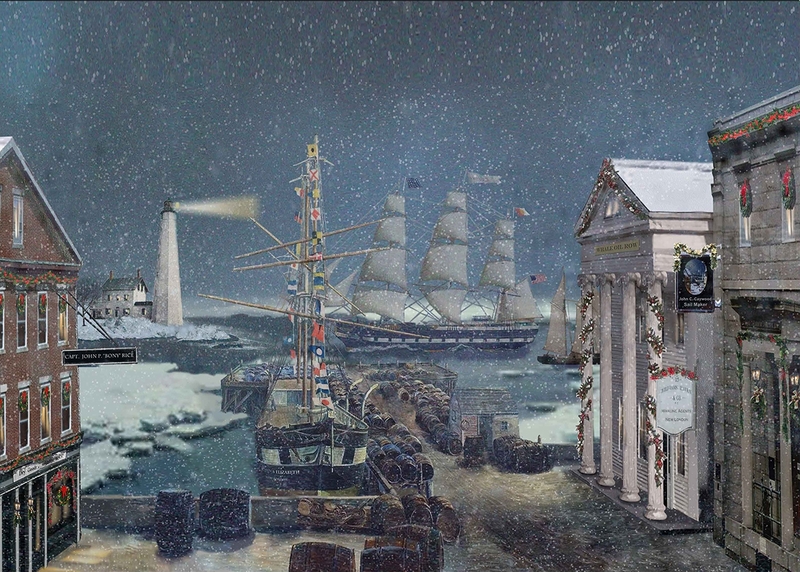 Featuring sights such as tall ships in port, a sea captain’s Victorian home, lighthouses and other well-known landmarks, the new scenery will transform the Garde Arts Center’s stage into a wintry day in New London during the 1850s. One of the scenes even recreates the ice fields of the Arctic, where the city’s whale ships once ventured on harrowing voyages. All of the new backdrops are the creations of Fufan Zhang, an accomplished young set designer and artist who received her MFA from Yale School of Drama. Zhang has designed sets for some of the Northeast’s leading theater companies. The giant backdrops for ECB’s “The Nutcracker” were built here in Connecticut at the Yale School of Drama’s set design shop. “The Nutcracker” ballet has been casting a spell on young and old for more than 125 years, but ECB’s version is like none other performed by ballet companies from coast to coast. The Victorian setting is the point of departure for the central character of “The Nutcracker” to begin her magical voyage around the world. Special effects include a flying Christmas tree, a clock that looks like an owl, and other wizardry, as well as a full-blown snowstorm onstage. Tchaikovsky’s musical masterwork will captivate audiences with such beloved classics as the Waltz of the Snowflakes and the Dance of the Sugar Plum Fairy. The family-friendly event features two stars from the renowned New York City Ballet (NYCB): Sara Mearns, often called “the great American ballerina of our time,” and Jared Angle, an artist with high acclaim in the world of dance. Guest artists from Miami City Ballet and no less than 100 professionally trained dancers from ECB will share the spotlight. Few know the world’s most popular ballet as well as ECB artistic director Gloria Govrin. She has performed in or directed “The Nutcracker” for decades, many of those as a soloist with NYCB under the direction of George Balanchine. A legendary ballet master, Balanchine made “The Nutcracker” an American tradition, and the ECB performance captures his spirit in every step and grand jeté. The timeless story of a little girl with big dreams, “The Nutcracker” requires a huge cast of dancers and actors. In addition to the heroine Clara and her brave Nutcracker, memorable characters include the magician-like Uncle Drosselmeyer, the clownish Mother Ginger, tiny mice, the Snow King and Snow Queen, sailors, pirates, waltzing flowers, dancing snowflakes and many more. From her pointe shoes to tiara, Sara Mearns is every inch the Sugarplum Fairy. The curtain rises on Saturday Dec. 8 at 1:30 and 7 p.m., and Sunday, Dec. 9 at 1:30 p.m.
To share all of the magic of “The Nutcracker” with friends and family this December, visit tickets.gardearts.org or call the Garde box office at 860-444-7373, Ext 1.